I caught Alice playing Just Dance yesterday. Besides being worth a smile, I really liked how closely she was attending to the game. I wish Alice would play it more than she does because it is a visually driven game (people with Down syndrome tend to be visual learners), it is active, and Alice loves dance. I touched on this briefly, yesterday and in the past: the current raft of kids are very different from when their parents were kids. They have grown up with changes in gay rights and have grown up with inclusion. They've grown up learning to accept and celebrate differences. My generation - not so much. Kids with disabilities, especially cognitive ones, were either taunted or beatified. The teasing was almost certainly because we could either get a reaction or didn't have to worry about them fighting back. It's weird seeing the generational differences. Today, E and I had a meeting and I was wearing a Bruins sweatshirt that I picked up at an MDSC hockey game. The man we were meeting with asked me if I was a Bruins fan and I explained about Alice. I watched him closely when I said, "Down syndrome" and saw his brow knit in concern and he said, "oh, I'm sorry." And I do not fault him for his reaction. Though he is an educated man, he is as much a product of his own generation as I am of mine. This is something that Alice brought home from school. It's a project that is being done in class. I don't know any more about it from what you see, but I assume that 7 of her classmates gave her compliments. They could very well have been out of pity, but given this group of kids and how I've seen them act, I doubt that very much. To quote The Who, "the kids are alright." From my generational perspective, I expect worse. I'm waiting for terrible behavior. I'm waiting for reports from school. I'm waiting for Alice having a horrible day and us left to figure out what happened through forensics. Instead, we consistently get this kind of thing. Part of it is Alice. She is outgoing, trusting, and genuinely likes other people. And her friends get that and reciprocate. Alice and I have had a very busy several weeks. We are both in this year's Nutcracker which eats up Saturday, and a good chunk of Sunday is shopping. 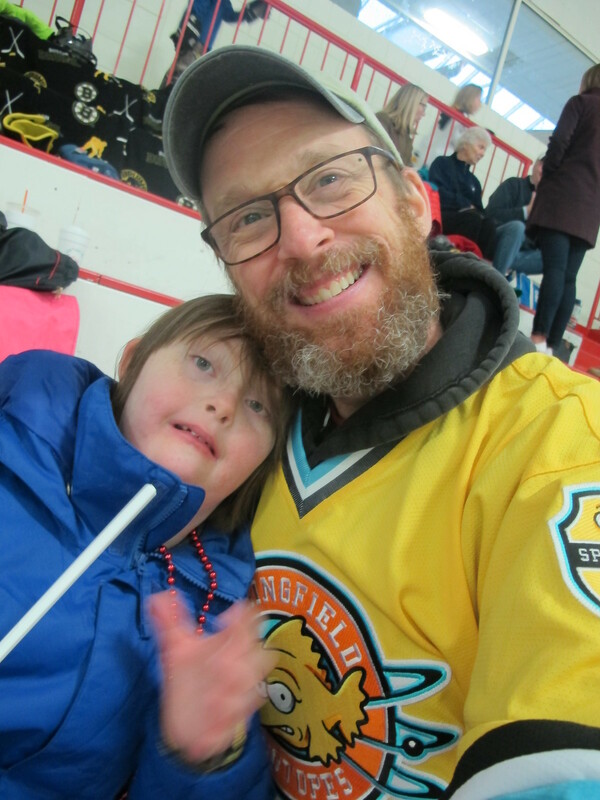 This past Sunday we went to the MDSC Hockey game. We've been going for 7 years. Alice really enjoys going and especially likes the free skate that they do beforehand. In previous years, we've put Alice in a chair from the arena and pushed that, but she's getting too big for that and as the plastic chair gets cold, the legs are prone to breaking. This year, I contacted Amelia Park, a local ice rink that allows people with disabilities to use sled hockey sleds that they have on site. I asked if they would be willing to lend us one for the day and they quite kindly let us borrow one. This is so much better for both of us. Once again, the players we talked to were very kind. 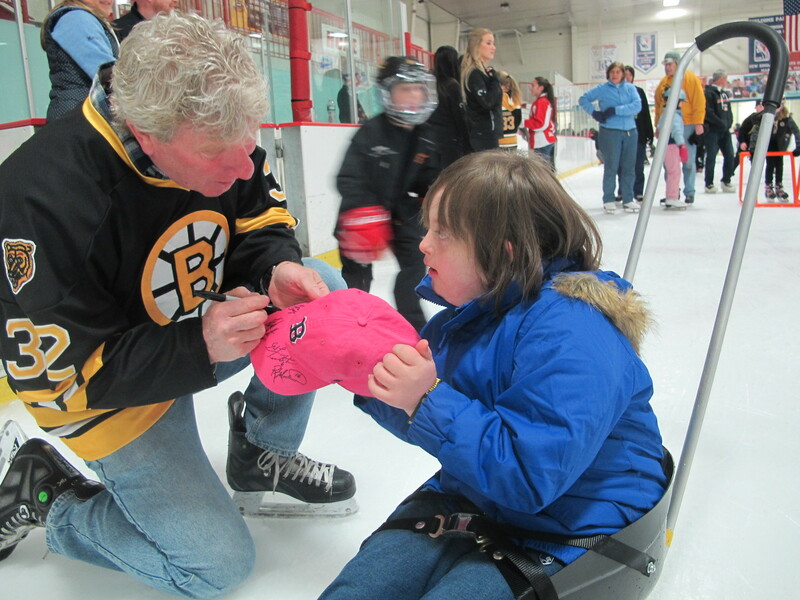 Frank Simonetti asked Alice if he could sign her hat and Alice said yes. Then the other players signed it too. Above is Bruce Crowder adding his name to the brim. During the free skate there were a number of younger boys who were zipping around at high speed being little hooligans. This is inevitable. More speed than good sense. What was surprising was an older boy named Luke who came up and talked to Alice and asked her questions and listened to her answers. He was polite and patient and, well, nice. We ran into him a few more times later in the day and it was more of the same. You're awesome, Luke. On a separate note, Alice's go-to phrase for years for when she wants something has been "need help please." This is starting to change and it's charming: "Daddy, can you do me a big favor please?" Wonderful. Perseveration. Yeah. I don't know if this is a Down syndrome thing or an Alice thing. Alice perseverates on things. It's not always predictable, but when it happens it's endless. You know how your typical kid gets a copy of the most recent Disney/Pixar movie and watches it again and again? You know how you used to like Frozen until you started to swear that if your heard "Let It Go" one more time, blood would flow from your ears? Yeah. That's nothing. This is Alice on the Monday after Hallowe'en. She immediately focused on Christmas and Thanksgiving. "Thanksgiving is on Thursday?" "Not this Thursday, Alice." "Is on Thursday?" "In more than three weeks, Alice." "Then Christmas?" "That's in December. It's November." "Is Thanksgiving on Thursday?" "No, on this day. (pointing to the calendar) This day is Thursday this week and then you go this many weeks until Thanksgiving." "And then Christmas?" At this point, E and I have discussions about when we are going to reveal treats. On the one hand, we like to reward the kids and to let them know when something fun is coming up. On the other hand, we don't want to mention something earlier than when we want to hear about it day in and day out from Alice. Still, I can take advantage of perseveration. The school bus arrives at around 7:15. We need to step back 5 minutes for putting on shoes and coat, and then a loose 5-10 minutes for reward time, then a half hour for self-care, then 20 minutes for breakfast. Than means that Alice needs to get up at 6:00. I go into her room and give her a nudge. "Today is Monday?" "Yes, Alice." "Is school day?" "Yes, Alice." "Is home day?" "No, Alice." Now, I don't know how you get your kids out of bed, but with Alice, I've found that I can stand back and say, "I'm waiting for my morning hug!" and that will get her out of bed. Patterns. Alice likes consistent patterns with predictability. Alice likes the same things, again and again. Alice is so worried about this that she perseverates and asks the same questions again and again. It's hard to maintain patience and then responses like, "How many times do I have to answer that?" slip out. Oddly enough, Alice has a stock response to that rhetorical question. "FIVE." Slightly more constructively, I can instead try, "Alice, did you ask this question already?" "Yes." "Did I answer it?" "Yes" Then asked and answered."